We are dentist Ahmedabad, India having more than 20 years of experience in Implant, Laser, General, Cosmetic and Digital Dentistry. Our dentists keep up to date with the latest dental technologies and innovations. Dr. Viral Patel is a preeminent cosmetic implant & laser dentist in Ahmedabad with years of in-depth training in most modern dental technologies. Dr Viral Patel’s significant portfolio also boasts upon numerous noteworthy memberships on national and international levels. 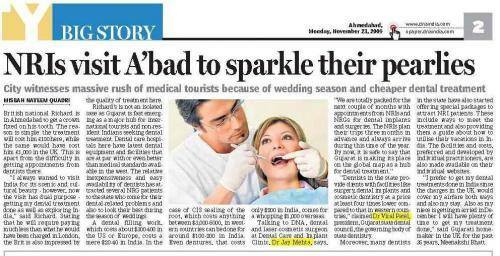 Apart from an active member of American Dental Association, Dr Viral Patel is also President of Gujarat State Dental Council. He is President of Indian Dental Association Gujarat state, past president of Indian Dental Association Ahmedabad & PHD guide in Gujarat University. Dr Viral Patel is advisor on boards of various Pharmaceuticals, Dental Implants Manufacturers and Biotechnological companies. He is also a Key Opinion Leader Dentist for Glaxosmithkline [GSK] India, Biomet 3i USA & Dentsply Implants India. He is also a KOL & Mentor for Bio3 Implants Germany, Alphadent & Impact Implants Israel. Dr. Viral Patel has been also acknowledged by many national and international journals for his informative and innovative articles on Dental Implants, Periodontology & Laser Dentistry. Indian Dental Association has also felicitated him with dental research award for developing bone graft material first of its kind. At Dental Clinic Ahmedabad of Dentist Ahmedabad, India – Dr Prof Viral Patel, Sterilization & Disinfection [Infection Control Protocols] are monitored by university of Louisville, USA. They follow ADA, CDC, OSAP & OSHA norms. Implants can be a great alternative for patients who are missing individual teeth or wearing dentures. Regular dental visits are essential for the maintenance of healthy teeth and gums. Get All Solution Under One Roof: Dr. Viral l. Patel Dentist in Ahmedabad Is the one of the famous dentist all over in Ahmedabad. Teeth make our face bright by our smiling. So take care of your teeth by getting treatment from DENTIST IN AHMEDABAD. We provide best dental treatment in Ahmedabad. Smoking cannot only damage your general health, It can also have serious consequences for the mouth, gums and teeth. · Pain when chewing & Etc. DENTIST IN AHMEDABAD - The Best Option For Your Dental Treatment. A #loose_tooth in adulthood doesn't occur without cause. You may initially notice looseness while brushing or flossing, or your #dentist may notice some wobbling during a routine dental appointment. Dr. Viral Patel is one of the best #dentist_in_Ahmedabad offer Same Day Implants. Get The best world class implant laser and digital dentistry in ahmedabad.We provide the best and advance technology which is now in the market because for us patients are at number one to focus. For more info visit our website : https://www.drviralpatel.com/ or call on 9825060235. One of the best things a parent can do for their child's oral health is to schedule a #pediatric_dental check-up today. Dental fillings are most commonly used to treat a cavity. It is a treatment option to help restore the function and appearance of a tooth that is damaged or decayed. #Dental_crown is used to entirely cover a damaged #tooth to strengthen it, to improve its appearance, shape or #alignment. These are used to protect a #weak_tooth, replace a large filling and in covering a #dental_implant. Are you missing teeth due to disease or injury? We offer teeth replacements for multiple teeth! we can replace missing teeth with permanent natural looking replacements. All teeth want is a little love. They just need some professional attention at least every six months; that's all. Love them before you lose them. Do you have missing teeth or no teeth or loose dentures? Don’t worry, Dental Implant Ahmedabad are here to help you! Benefits: They are Strong, Comfortable & Long lasting! Are you worried about your missing tooth?? We offer an implant service called All on Four. This treatment can be completed in just one visit!- bit.ly/2ONQvlr. #Dentist_In_Ahmedabad has advance and latest solution for your missing tooth. PRESIDENT - "GUJARAT STATE DENTAL COUNCIL” INDIA. PROFESSOR & HEAD, DEPT. OF PERIODONTIA, ORAL IMPLANTOLOGY & LASER DENTISTRY, COLLEGE OF DENTAL SCIENCES, AHMEDABAD, GUJARAT, INDIA. EX- ASSOCIATE PROFESSOR & POST-GRADUATE GUIDE, DEPT. OF PERIODONTICS & IMPLANTOLOGY, K M SHAH DENTAL COLLEGE, BARODA, GUJARAT, INDIA. KEY OPINION LEADER [KOL] FOR GLAXOSMITHKLINE [GSK] INDIA. Consultant Periodontist & Oral Implantologist, APOLLO HOSPITALS LTD., AHMEDABAD, GUJARAT, INDIA. Consultant Periodontist & Implant Surgeon at various dental hospitals & clinics in Ahmedabad as well as Gujarat State, Rajasthan, Delhi & Maharastra States, India. Advisor on board of various Pharmaceuticals, implants manufacturers and Biotechnological companies. Inventor of Synthetic Bioceramic Hydroxyapatite (HA) Bone Graft, Fist time in India in the year 1998. Has received 3 Gold Medals during his graduation, for obtaining highest marks & standing first in university exams. DR. VIRAL PATEL has been acknowledged by many national and international journals for his informative and innovative article on Dental Implants and Periodontology. He has been requested to share his Extraordinary Quest for the continous research and implementations in Periodontics and Implantology on the dias with renowned national and international speakers, and he has obliged by doing so several times.